Today on That Business Show, I had the pleasure of welcoming Expert Contributor Lynn Wise to the program for her first appearance. 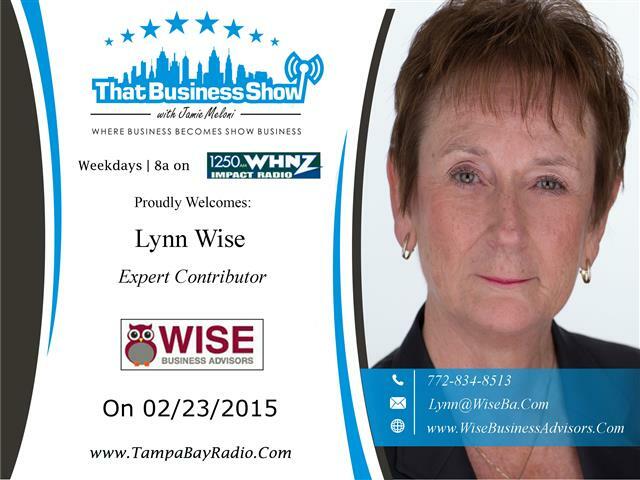 Lynn Wise is the Founder and CEO of Wise Business Advisors and is the author of “Build It, Grow It, Sell It! Nine Steps to a Thriving Contracting Business.” Over the last 35 years, Lynn has owned five successful small businesses including a plumbing and heating repair and remodeling company. Lynn’s current project focuses on assisting contractors develop a brand and structure to their business whereas many focus strictly on the trade itself. Lynn has extensive experience with contractors both in the field and as an advisor and is ready to help you brand and grow your contracting business today. Learn more about your business whether you are a contractor or another business owner by taking her free Value Builder Score at her website, http://www.wisebusinessadvisors.com. This survey is a brief 15 minute assessment and will give Lynn the input needed to help you with a follow up discovery session that can help you grow your business. Contact Lynn today on her site or email at Lynn@WiseBa.Com or phone at 772-834-8513. 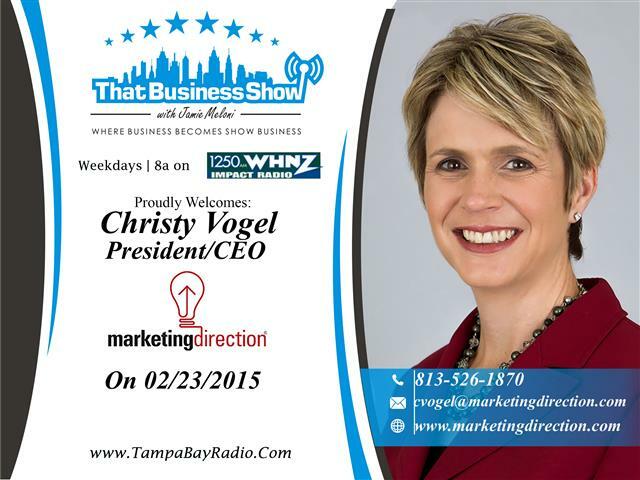 On the 2nd part of the show, I spoke with the CEO/Founder of Marketing Direction, Christy Vogel. Marketing Direction solves the complex problem many companies face during growth of needing a VP of Marketing but do not have the funds available or quite enough work to get them busy enough to justify the cost. Her firm offers marketing services on a contractual basis to fit your company’s need. You can use their services as little or as much as you need and will save on overhead by not having to pay payroll taxes or other costs associated with employing a full time professional. She spoke of the day she was fired as being the best day of her life as it launched her into this new business opportunity and over the past 5 years, she has grown it to be a successful Tampa Bay business. Learn more about Christy at her website, http://www.marketingdirection.com or contact her via phone at 813-526-1870 or email at cvogel@marketingdirection.com!